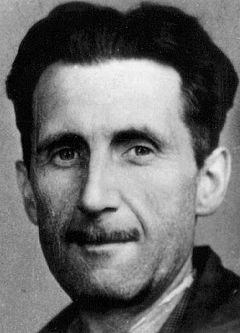 Eric Arthur Blair (25 June 1903 – 21 January 1950), better known as George Orwell, perhaps considered as the twentieth century’s best chronicler of English culture. Orwell wrote fiction, polemical journalism, literary criticism and poetry. He was best known for the dystopian novel Nineteen Eighty-Four and the satirical novella Animal Farm. Together the two books have sold more copies than any two books by any other twentieth-century author. His Homage to Catalonia, an account of his experiences as a volunteer on the Republican side during the Spanish Civil War, together with his numerous essays on politics, literature, language and culture, are widely acclaimed.Wile fighting as a volunteer on the Republican side during the Spanish Civil War, George Orwell was staying at the Hotel Continental in Barcelona. He later got wounded and wrote the famous novel Nineteen Eighty-Four, wile recovering in the Hotel (The novel was published in 1949). Today you can find the Plaça George Orwell in Barrio Gothic, Barcelona and there is a street named after him in Mallorca. George Orwell was an English author and journalist who’s work is marked by keen intelligence and wit, a profound awareness of social injustice, an intense, revolutionary opposition to totalitarianism, a passion for clarity in language and a belief in democratic socialism. Homage to Catalonia is George Orwell’s personal account of his experiences and observations in the Spanish Civil War. The first edition in Europe was published in 1938, but the book was not published in the United States until February 1952.